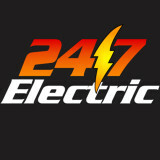 At 24/7 Electric, we are here to set the example of what to expect when you hire an Electrician. It is our goal to be the authority on ethics and electrical code in the residential service industry. Our strength is our passion to provide honest quality work to our customers. We achieve this by employing educated, experienced staff who are as passionate as we are. Our staff are trained for their specific division and work to be experts in that field. That dedication has been the success of our growing loyalty program, the referrals and repeat business we receive from our customers. With our trained staff we are also equipped to take on all of our customers' home servicing needs; from repairing a light switch to the electrical needs of a complete home renovation. It is our strong belief to give back to the communities we live in. 24/7 Electric and our employees are dedicated to supporting local non-profit organizations. One of our current initiatives is partnering with Habitat for Humanity; it is our commitment to give of our time, raise funds for programs and bring awareness to the organization and the important work that they do. We also encourage our employees to volunteer their time to associations in the communities they live, as well as attending team building days Habitat for Humanity and other organizations we have become affiliated with. Specialize in high end, custom residential builds and renovations. Also work closely with various commercial builders and renovators to refit restaurants, bars and pubs with new lighting fixtures and displays. We will give you the "WOW!" service you expect at a great price! BBB accredited with A+ rating! and 60+ positive reviews online through various organizations. We are also independently recognized as the best electrical contractor in Victoria for 2017 and 2018 by thethreebestrated.ca , We offer a lifetime warranty on our labour. Our goal is to provide constant exemplary and personable service to fulfill all your electrical and telecommunication needs. What do licensed Victoria electricians do? An electrical contractor plans, installs and repairs wiring in structures. He or she works closely with the home’s general contractor or remodeling contractor to determine the specific electrical needs for the project and to ensure that the wiring will meet Victoria, BC building codes. An electrical contractor’s job also includes installing and repairing fixtures, switches and other visible components of electrical systems. With today’s technological needs and advances, many electricians in Victoria, BC also are trained to install fiber optic and coaxial cables for electronic equipment. Certain electrical companies may design and install data systems and wire for security features such as alarms too. Some Victoria electrical contractors specialize in specific areas, such as HVAC, low-voltage appliances and systems and more, so be sure to ask about their training to see if it fits your project needs. Find a certified Victoria electrician on Houzz. Narrow your search in the Professionals section of the website to Victoria, BC electrical contractors. Here are some related professionals and vendors to complement the work of electricians: Lighting Showrooms & Sales, General Contractors, Solar Energy Contractors, Heating & Cooling Sales & Repair.